I mean well. Really. 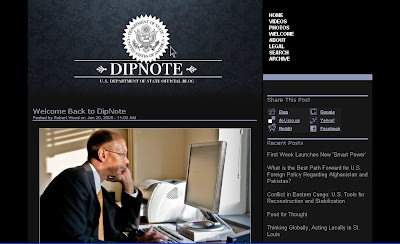 Even when I made fun of the launch of the State Department blog Dipnote with a parody blog of my own called Dopenote, I was honestly trying to help. Even when I gave your agency top awards for general terribleness in the rhetoric of e-government in 2007, it was because I cared enough to say something. Even when I suggested at the end of last year that you should just give up and chuck the whole blog into the cybervoid, the opinion was offered in the spirit of charity. After all, you know I am practically the only one reading. Foreign governments are probably not bothering at this point, since there is no real intelligence to be had here. Your own employees aren't likely reading the postings by their peers, despite the most polite not to mention diplomatic expressions of interest from their co-workers. Yes. You are trying. I can see that. You post entries like "First Week Launches New 'Smart Power'" to indicate that you know that this is about public diplomacy and a new take on "soft power." You post your "share block" to demonstrate that you have heard of social media, and we can see your Twitter postings in a column to the right. And I appreciate that you allow comments on your postings. But when is the writing for the web going to get any better? When will there be any actual information in the posts that citizens might choose to forward to each other? When, at the very least, will you start hyperlinking more regularly, perhaps to other diplomatic blogs from other countries? When will the tagging get better? When will there be links to research resources? When will there be links to maps and other kinds of geographical information representation? And when will you have quotable prose worth bookmarking?